If we have to name the style or feel that we have aimed for in the interior I think Midcentury Modern would be the closest. We have been striving for a mostly white, simple look with natural elements. 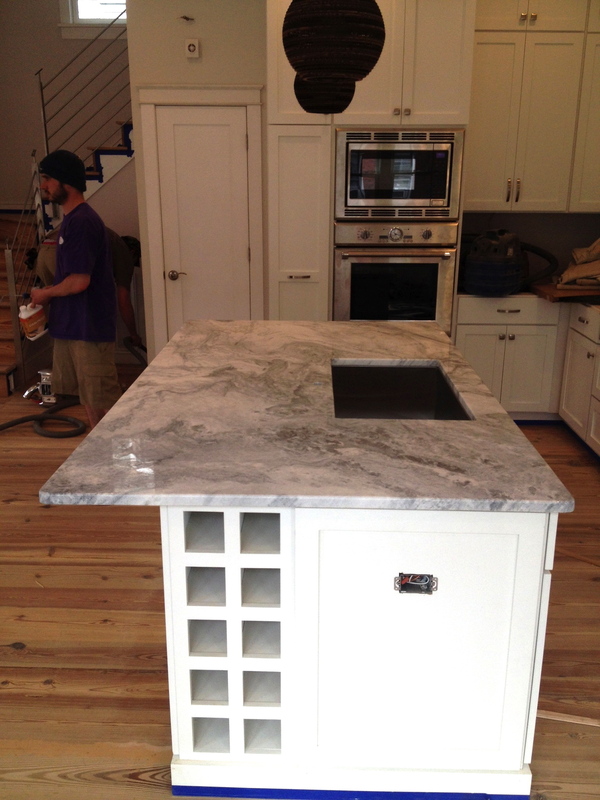 From very early on, we knew that we wanted to use white marble in the kitchen and baths. I read a great deal about the softness of marble and how it stains easily and requires more maintenance than other stones. Despite the drawbacks we began the search for the perfect marble. My decorator friend Wendy took me to a local stone distributor warehouse. Marva The Galleria of Stone is like an airplane hanger with rows of raw stone slabs. It’s not a cash and carry place for obvious reasons. 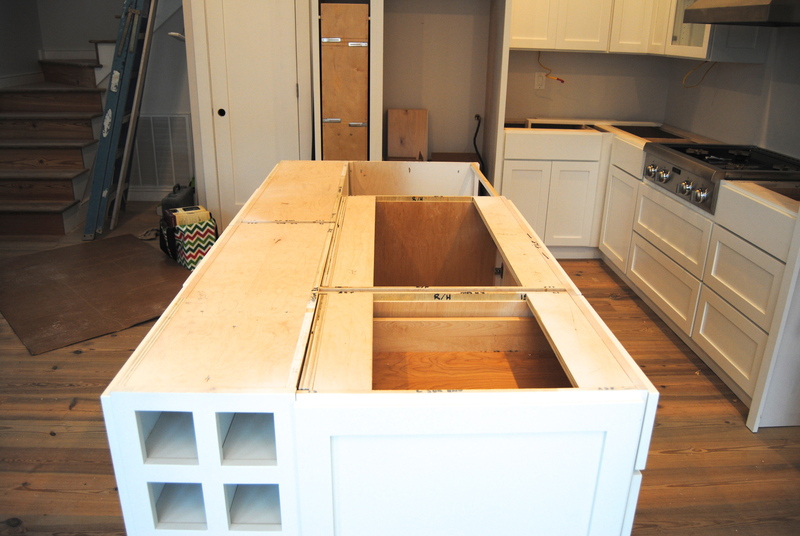 Once you select a piece you can tag it and then have your fabricator come and buy it for you. Each slab is assigned a color group and a price category. I tried to consider other stones but was continually drawn to the white marbles, mostly in the higher price categories, until we came very near to the end of the tour. The second I saw this piece I knew it was the one and was excited that it was in the lowest price category! We couldn’t figure out why because to us, it was the most beautiful piece in the warehouse. It was there that we decided that the island would be crafted from this slab of marble and the counter tops would be stainless steel. 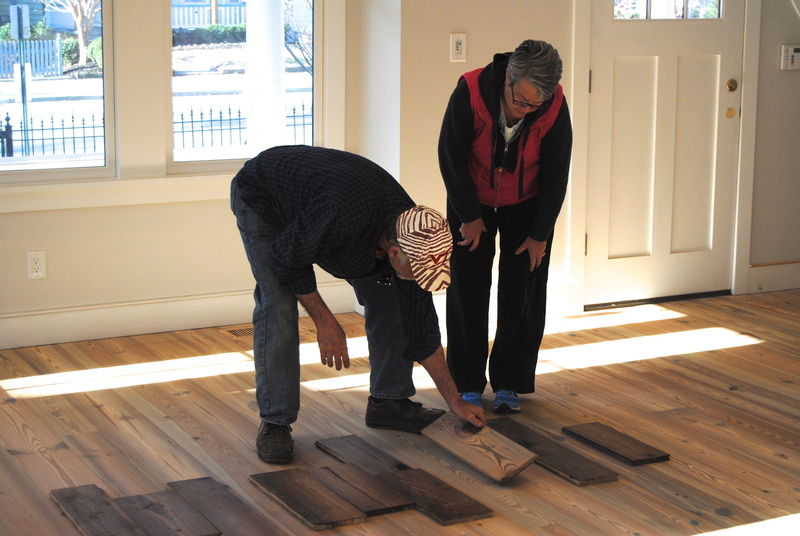 Last week the house emptied out and Antique Floors moved in to finish the floors. 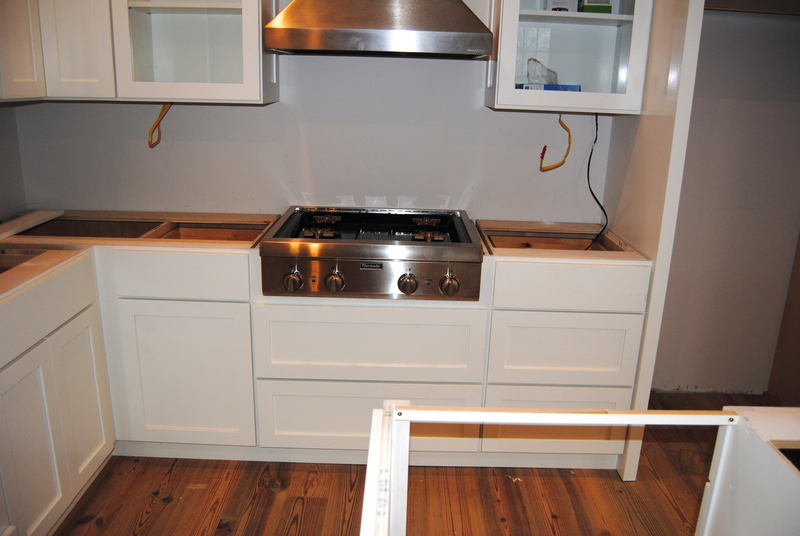 It took three days to sand and prepare the wood and another two days to apply and buff the finish. Large electric sanders were used to even the surface. 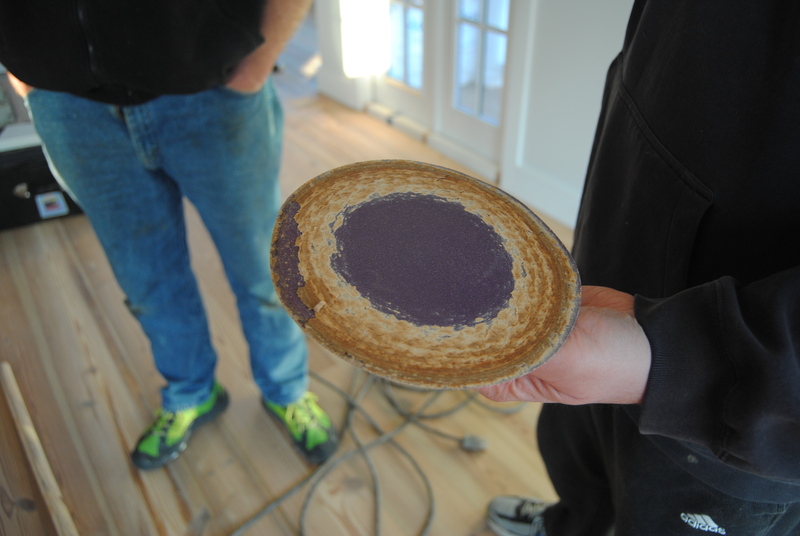 Cracks and spaces were filled and the edges were hand sanded with a 2-inch blade. This is sand paper from one of the rotary sanders. The build up is a combination of wood and sap. 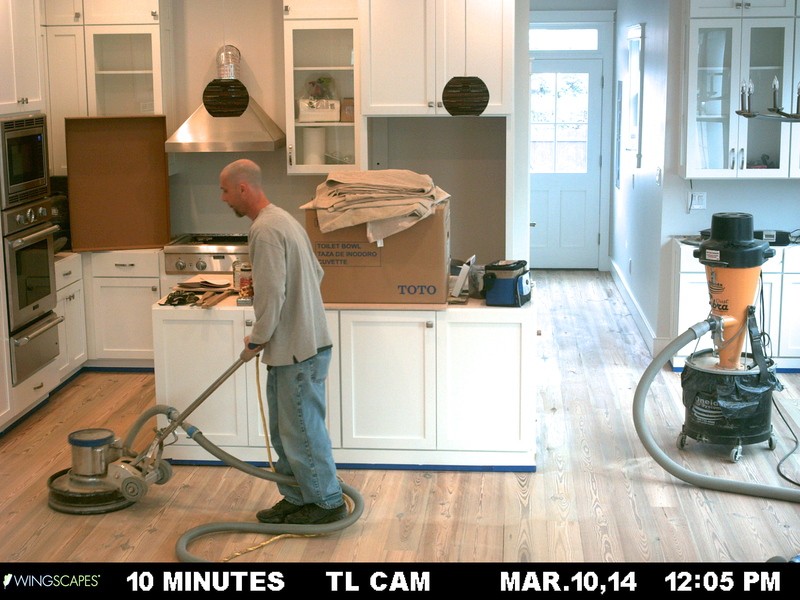 The pics with a date stamp at the bottom were taken by the time lapse camera we have installed in the living room to capture events that take place while we are not there. 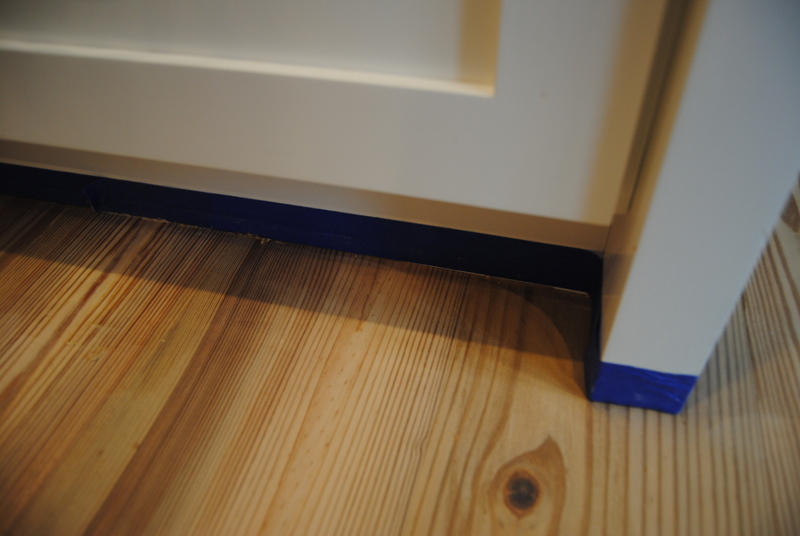 Here you can see a corner that the rotary sander missed. The corners and edges are hand scraped with a blade on a long handle. The blade has to be sharpened constantly. 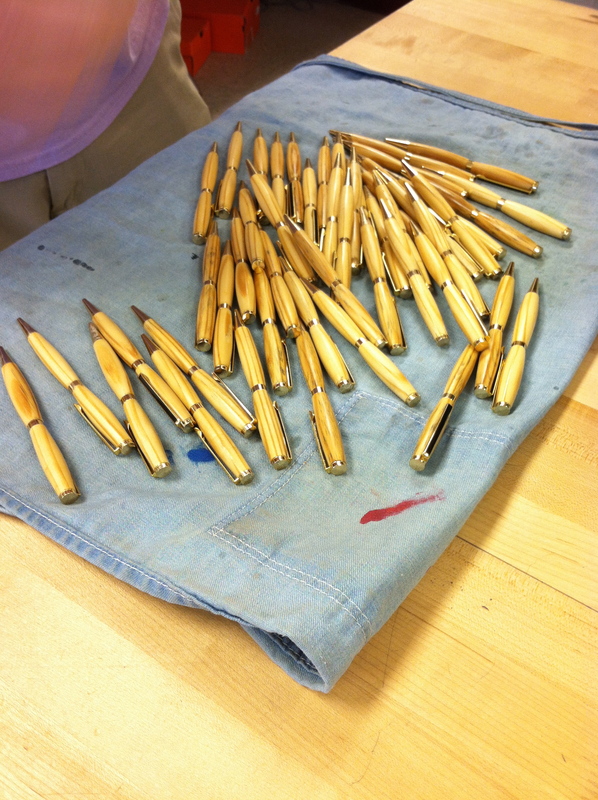 The team scooted around the periphery with a blade and sharpening file. 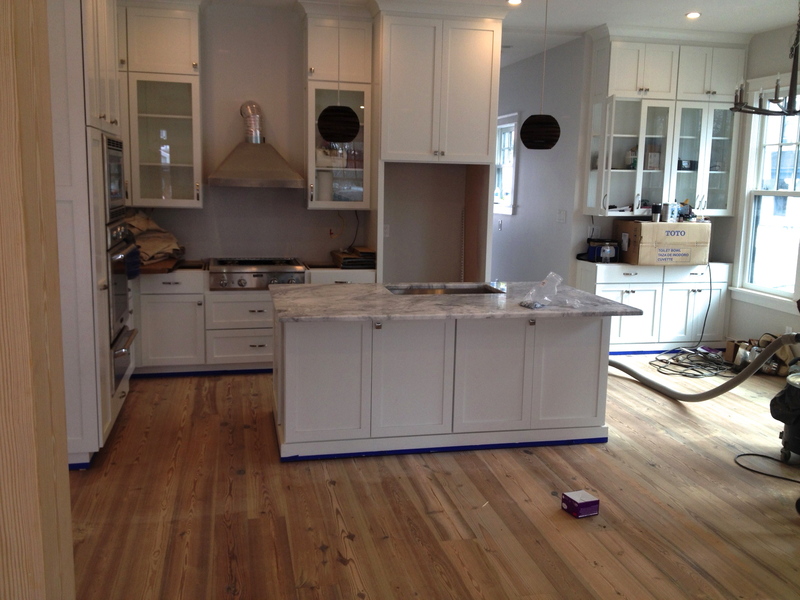 Once again, we felt like we had the best team available working on our floors. I was really impressed with the attention to detail by one person in particular. Turns out that he is a fantastic artist who not only sketches and paints historical pieces, but also specializes in painting on walls and floors. If you are on Facebook you can check out Blair Oliver Artist here! Blair prepared several color finishes for me to view and select the desired amount of darkness. The finish is a combination of natural oil and wax with brown pigment. 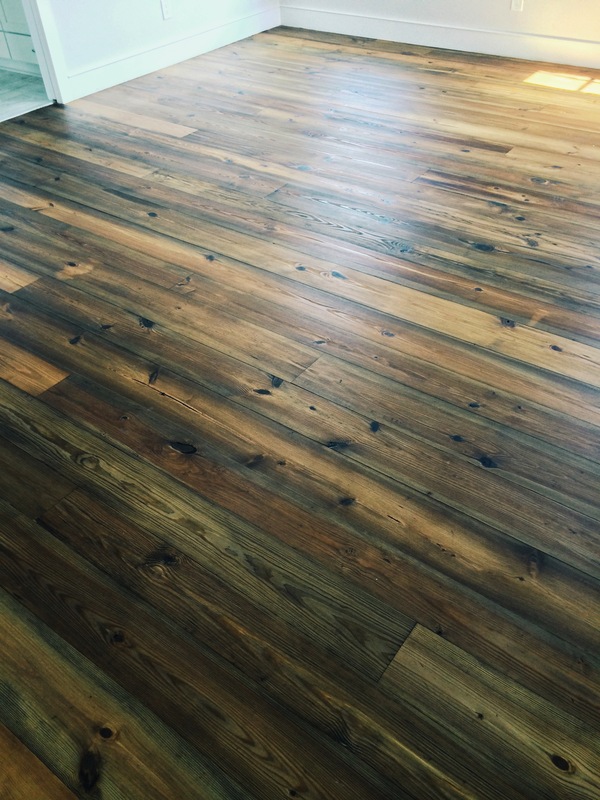 The finish does not include any polyurethane so there isn’t a long drying time involved or harmful VOCs. 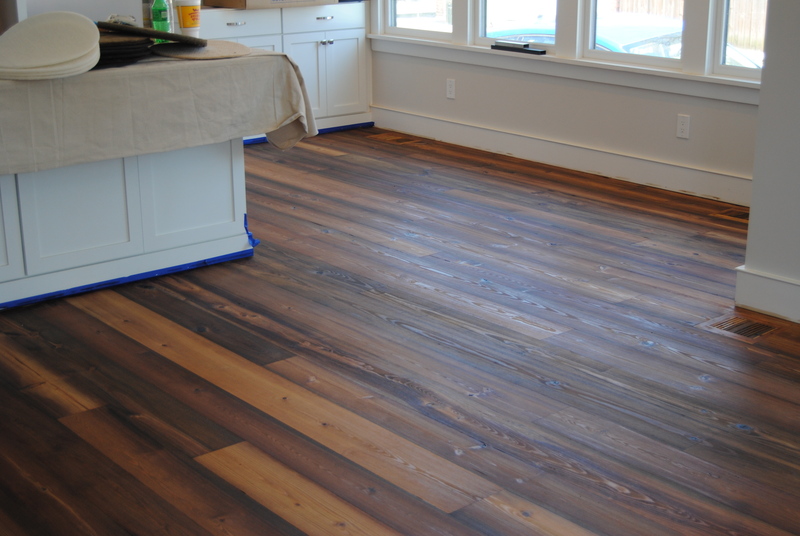 We are however, staying off the floor for several days to allow the oil to soak in completely and the wax to fully harden. 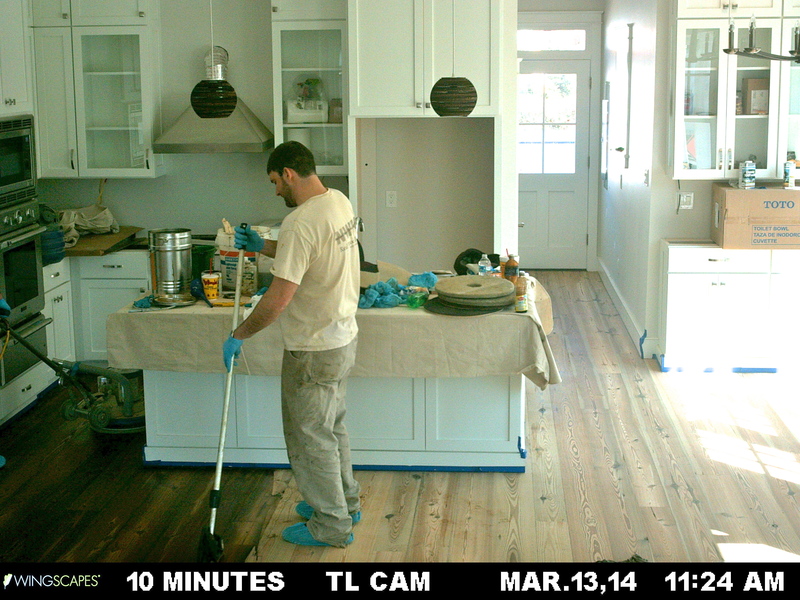 Daniel is applying stain and oil solution. We arrived when they were just about done. We put on some booties to look around and get some photos. 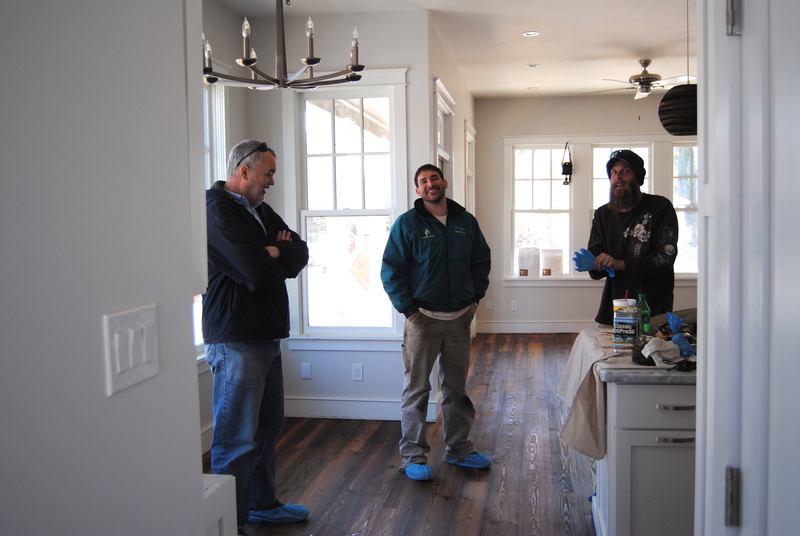 Patrick is on the left and Daniel, the owner of Antique Floors, is center. 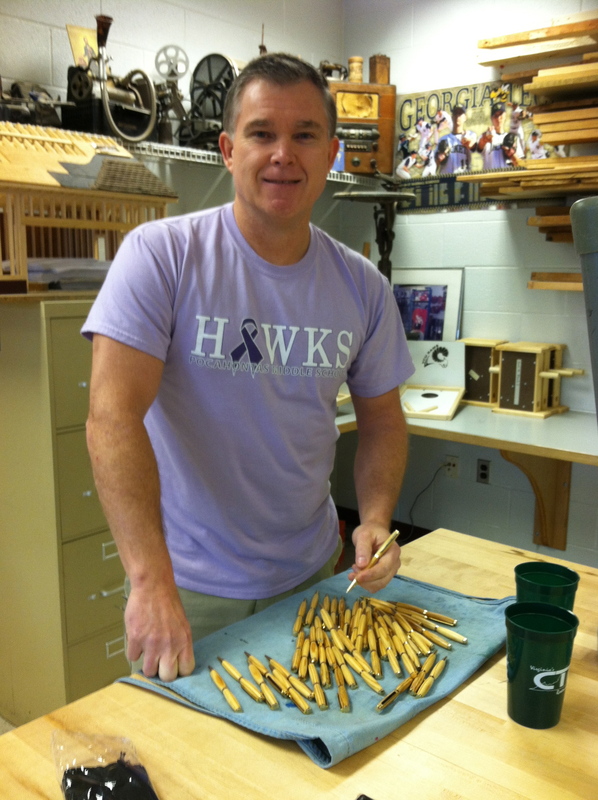 Blair makes the final passes with the buffing machine in the upstairs Flex Room. The kitchen completed. It turned out darker than we expected but we love it! In the direct sunlight it looks lighter. 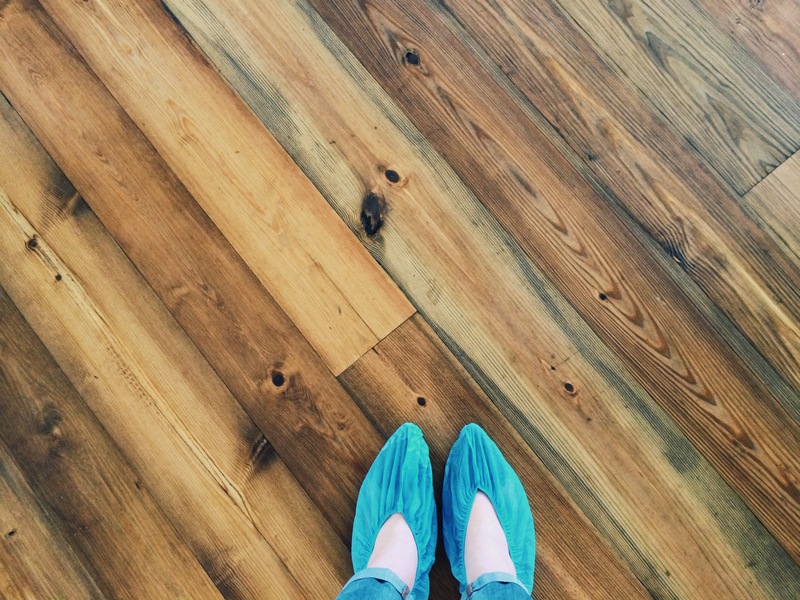 A few more days of booties and inspections and then we can start moving in some of our furniture! We have light and lots of it! 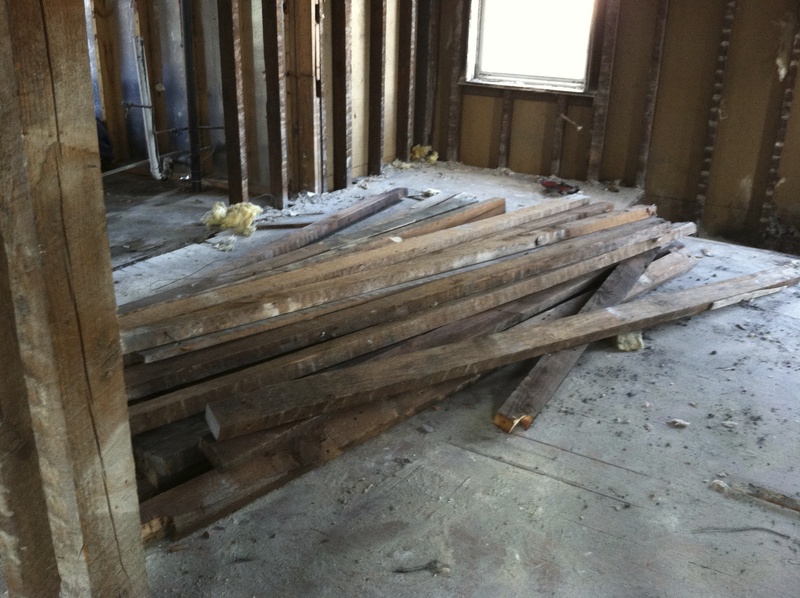 One of our main concerns for the redesign of our house was light, natural and artificial. City lots are typically long and narrow and the houses are very close together or attached to one other, reducing the amount of natural light that gets into your home. When we bought the house it was dark. The paint was dark, the carpeting was dark and windows were limited because every room had a fireplace on the outside wall. With the fireplaces removed we were able to incorporate more windows and since we have a corner lot we get lots of additional natural light. We are situated on the northwest corner, which means morning light in the living areas of the house. We are thrilled to have a detached home on a corner lot! Michael’s design placed French doors where there were once walls and doubled the number of windows in all of the common areas. We have also been very intentional about the artificial lighting. We have used the maximum number of can lights on the ceiling without being obnoxious and are using LED bulbs in each fixture. LED stands for Light Emitting Diode. They are fascinating little chips that put off light and are covered by a glass bulb or mounted on a strip for cabinet lighting. We are using LED strips in the kitchen under the cabinets and in our media room behind a cove on the ceiling to cast light upward. There are two huge positives to using LED lights in your home. First, they don’t produce heat which is healthy for our environment and for your home during the summer months. Secondly, they greatly reduce the energy consumption for lighting, reducing stress on the environment and your electrical bill. I found a series of short You Tube videos that discuss LED lighting and compare it to incandescent and compact fluorescent. If you are interested in some brief, succinct explanations take a look, especially if you like listening to snappy accents! 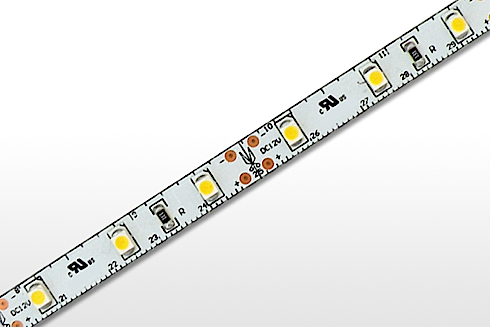 LED strip with the tiny chips that create the light. The US Green Building Council’s LEED certification program has a prescription that dictates the wattage of lights that can be used in the home. There is a formula for determining the points awarded for energy conservation. 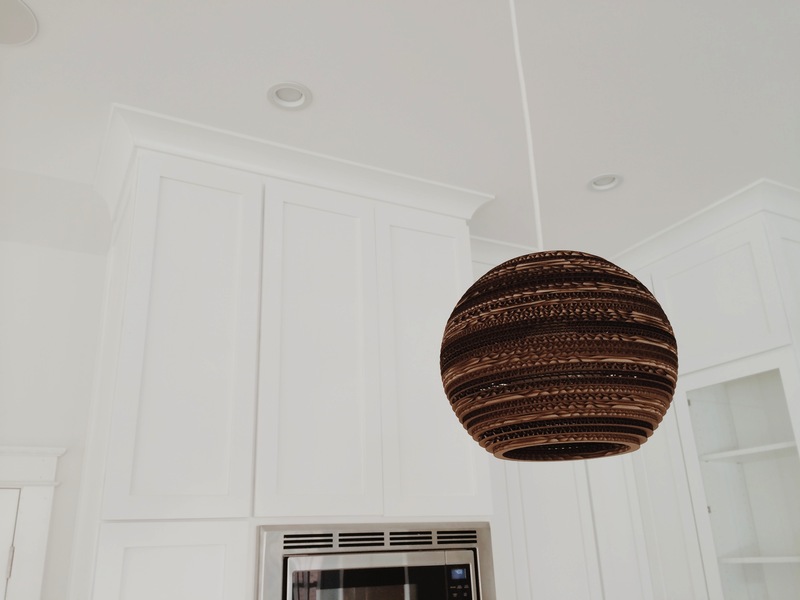 We are using LED bulbs in every light fixture except for the pendants over our kitchen island. These pendants need a bulb that reflects light in all directions. The LED technology aims in mostly one direction. Designs will catch up but for now we will be using compact fluorescent bulbs in those two lamps. Here is a look at some of the lights. We are obviously going for a contemporary look. Our island pendants are made from repurposed cardboard. The cardboard is salvaged from Walmart and Target stores, sterilized, laser cut into circles, pieced together with Elmer’s glue and treated with a flame retardant. At night when the bulb is on, the light sneaks out through the corrugated openings but this is what it looks like during the day. You can see a night picture by moving down to the last post about our Green Drinks open house. 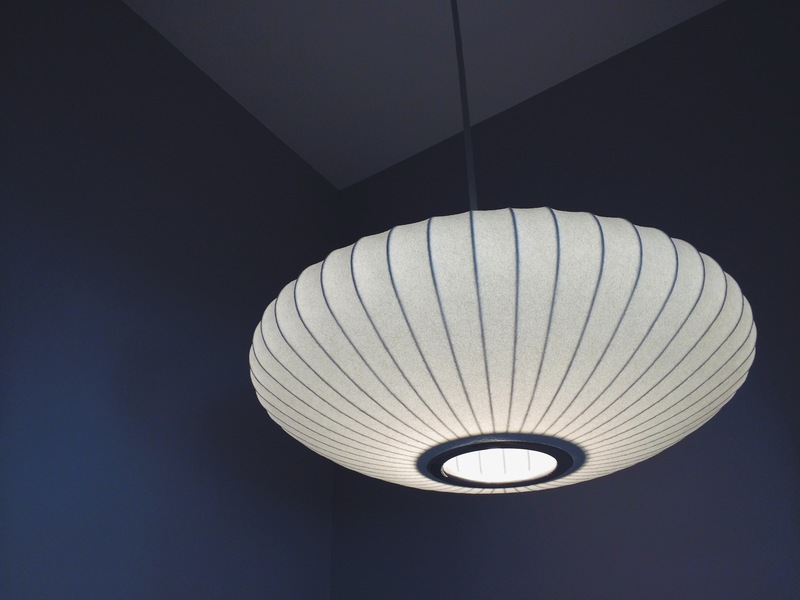 These lights are fabricated in the USA by Graypants. 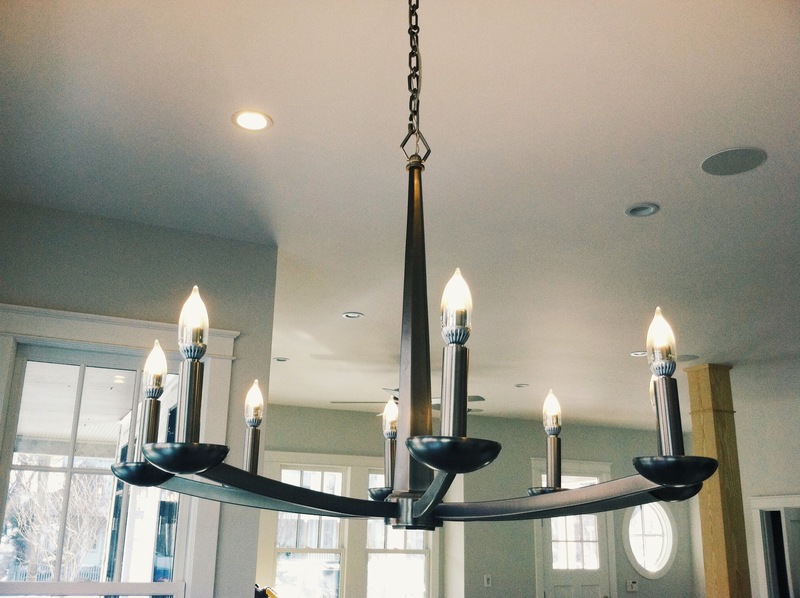 The dining room chandelier uses candelabra LED bulbs. One downside of LED bulbs is that they are typically pretty ugly. 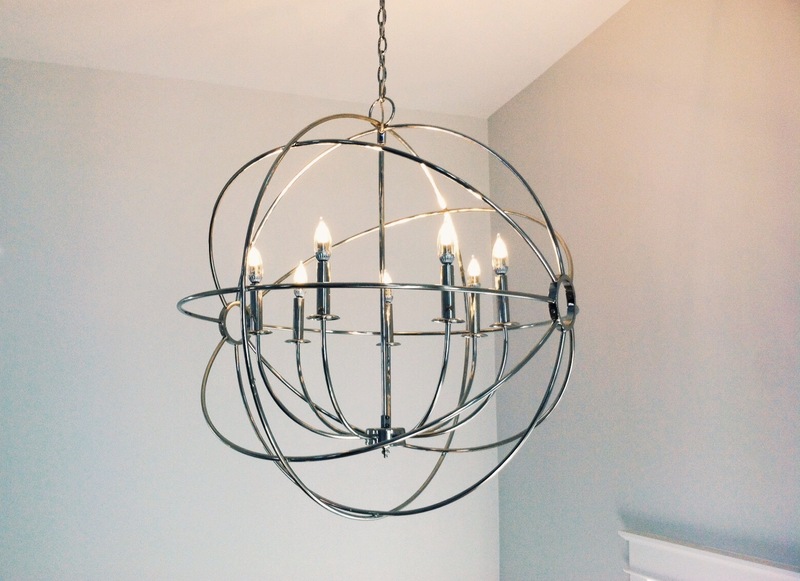 I found this chandelier almost a year ago at a greatly reduced price and bought it not knowing if we would ever find a LED bulb that wasn’t really weird looking. Fortunately, after hours of searching Patrick found these bulbs. They have a little glass tent inside over the chip to imitate a filament. These were the only ones that looked decent enough for a chandelier. Another drawback to LED is that they are very expensive, but they should last 20-23 years! These were less than half of the cost of some of the uglier ones! We also have a chandelier in the stairwell. We are using the same LED bulbs as in the dining area. I knew I wanted to use a George Nelson Saucer Lamp in the house. My idea to place a large one over the dining room table was vetoed so I ordered a small one for the powder room. Everyone loves it there! 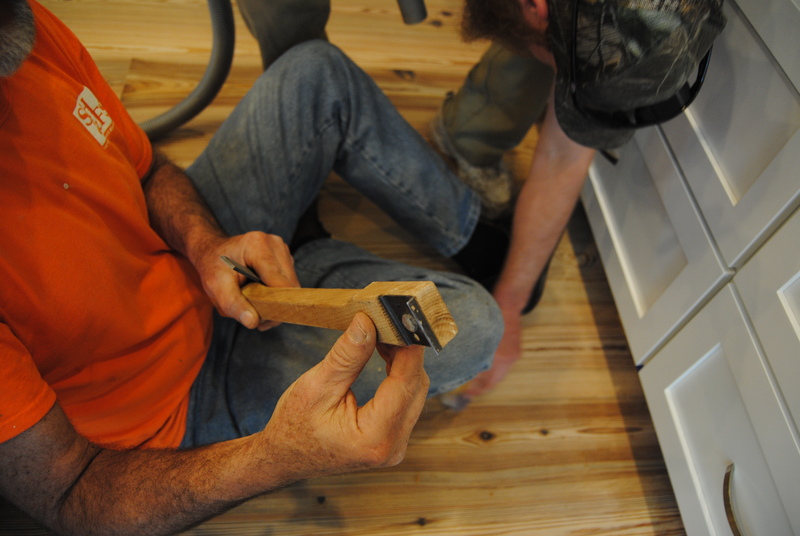 As you know, we have meant to be intentional, minimal and carefully resourceful in building our home. This mindset has become our guide not just for this project but for our lifestyle. Lately I have been uncomfortably consumed with cosmetic details. I have allowed myself to be taken over by knobs, pulls and hinges. I have spent a ridiculous amount of time on deciding the style and finish of these items and fretting over my choices. I don’t know if it’s because these details are important or not important at all but I am just burned out on decision making. I also feel a certain sense of shame in getting frustrated with such “first world” issues. Really, how important is a door knob? Fortunately the end is in site and most of the decisions have been made. We are all hopeful that the inside will be ready for us in the next 4-5 weeks. Once we are moved in these details will just be part of the landscape of the house and fortunately my micromanaging of them will fade away. 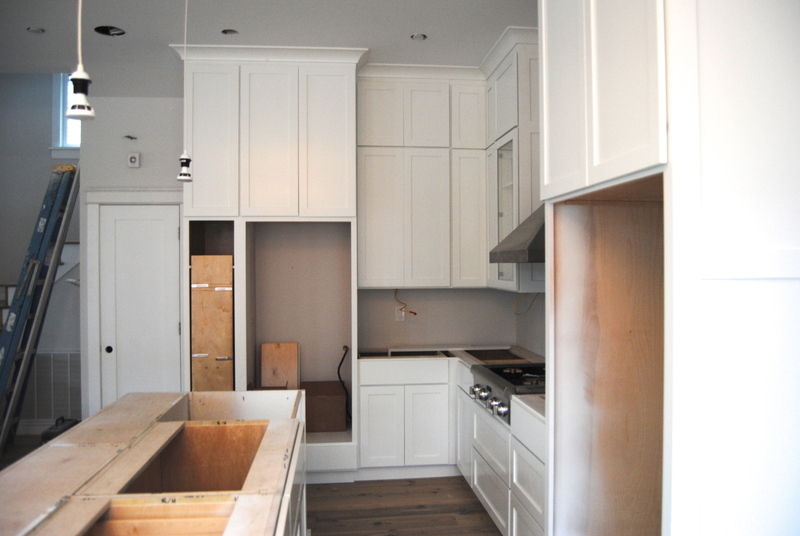 The kitchen cabinets are in place and we love them! Several weeks ago I found hardware that I liked on Overstock.com and ordered 75 of them to use in the kitchen and various other places around the house. They were a great deal but too good to be true. Beautiful and high quality but they had a 2.5” space between the screw holes which is an odd size. This would make it very costly to replace them later if we ever decide to do so. Those had to go back, all 24 pounds of them! 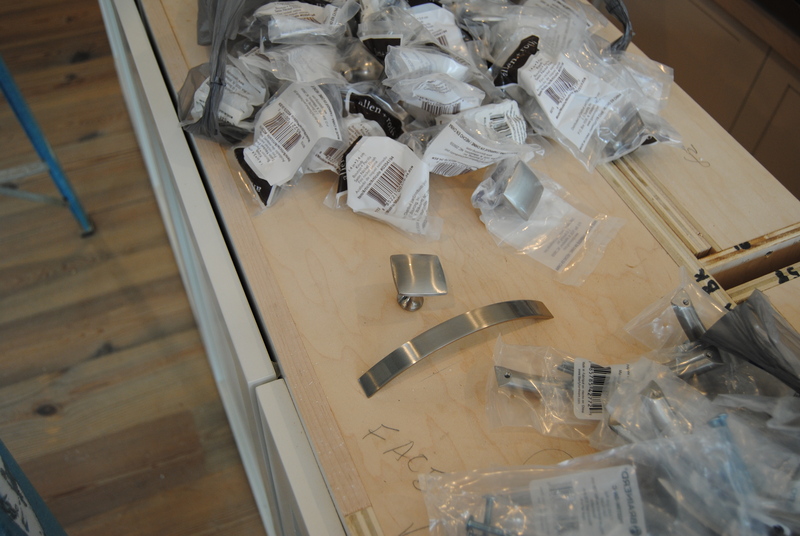 The next enormous load of knobs and pulls came from a trip up to Ikea in Northern Virginia, only to realize that the pulls and knobs were a slightly different color once they were out of their wrappings. The third time was a charm…a trip to Lowes brought home a selection of hardware from which we chose a coordinating pull and knob. Here is a look at how things are shaping up this week. 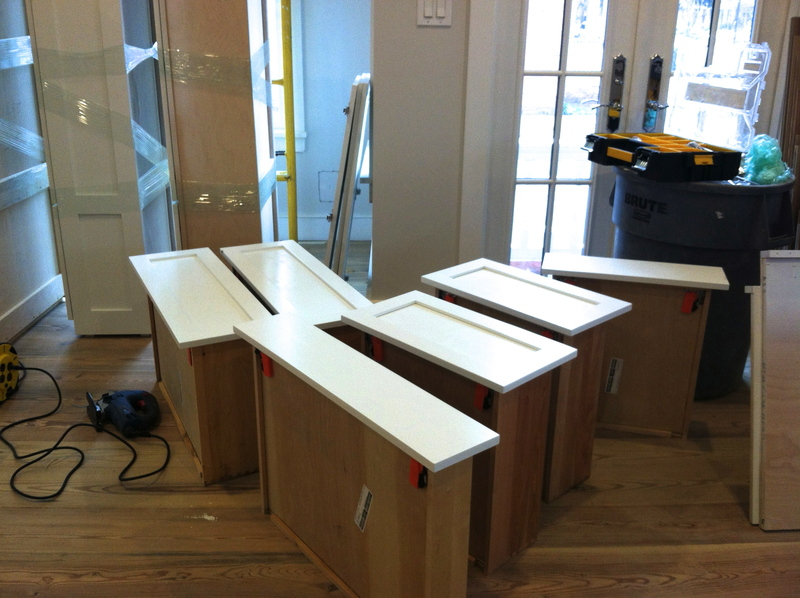 Cabinets and drawers arrive in the house. 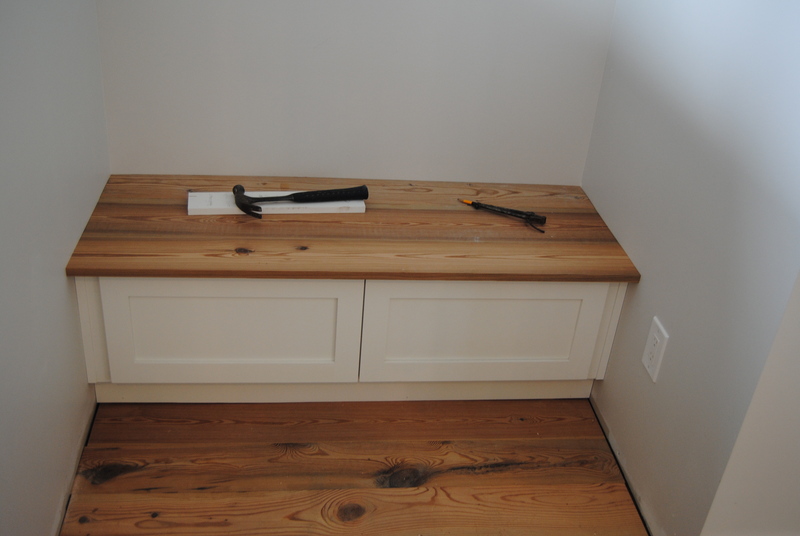 All of the wood used in the cabinets is FSC certified and finished with no VOC paint. 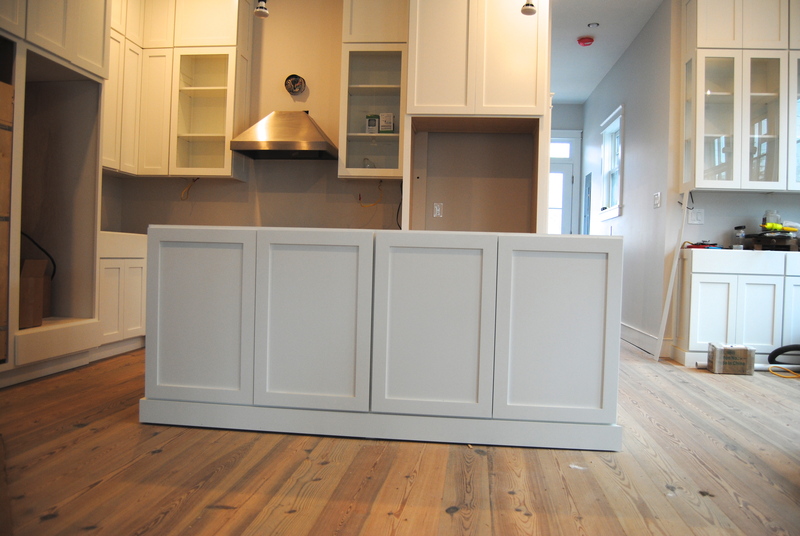 The cabinets were fabricated in Midlothian by Cary’s Mill Woodworking. 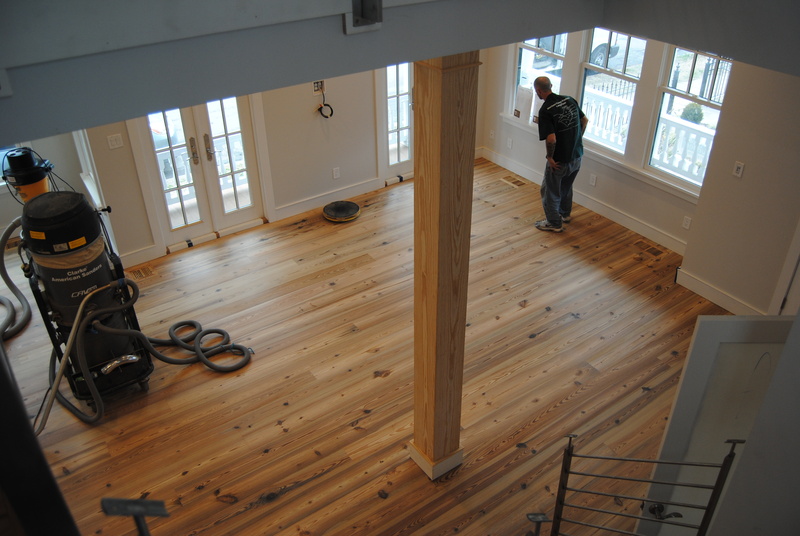 Cary’s Mill has been fantastic from the first phone call to final finishes taking place now! 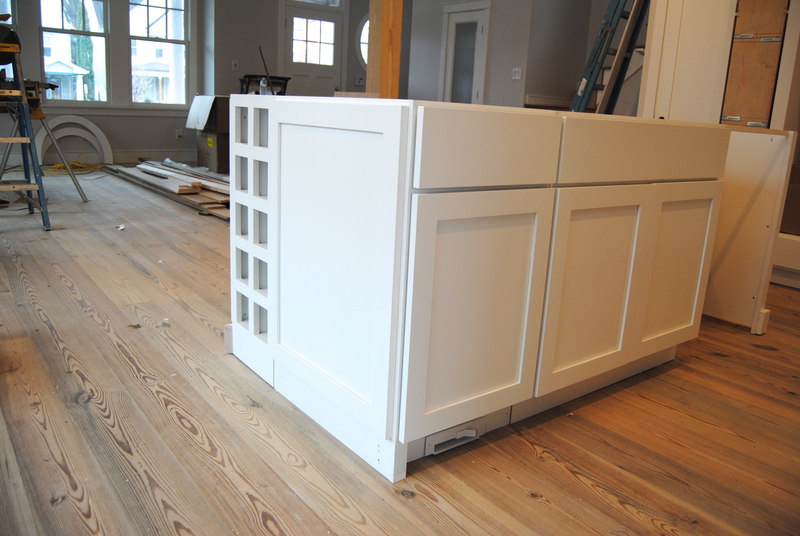 The island came into the house in five separate parts and was assembled in place. This is the view from the kitchen side. Do you see the little central vacuum kick vent in the bottom left? I’m excited about that little feature. I can sweep junk up to the vent, tap the lever with my foot and the vacuum will turn on to extract the pile of debris. Final decision on hardware; knob and pull. LEED points are awarded for a permanent shoe removal area at the door. 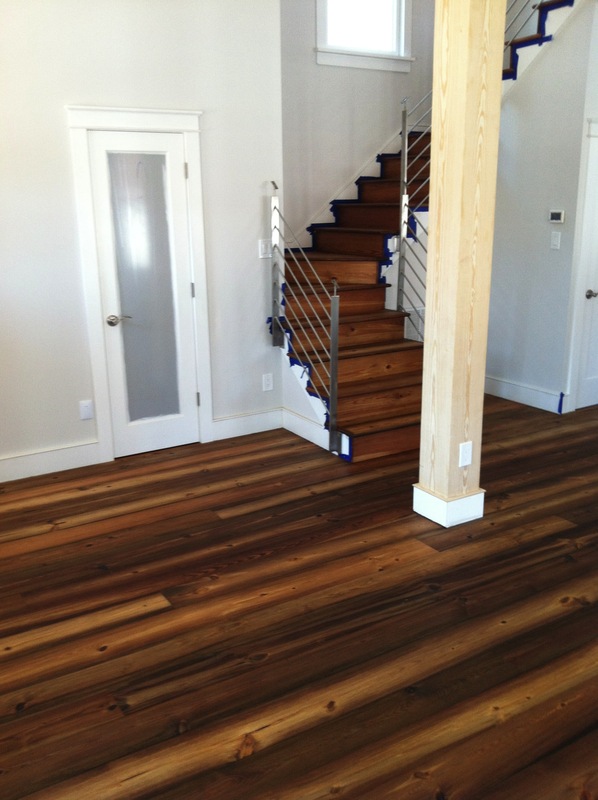 This is in an effort to keep your interior clean and improve indoor air quality. The area around the shoe station cannot have carpeting and there must be room for two pairs of shoes per bedroom. 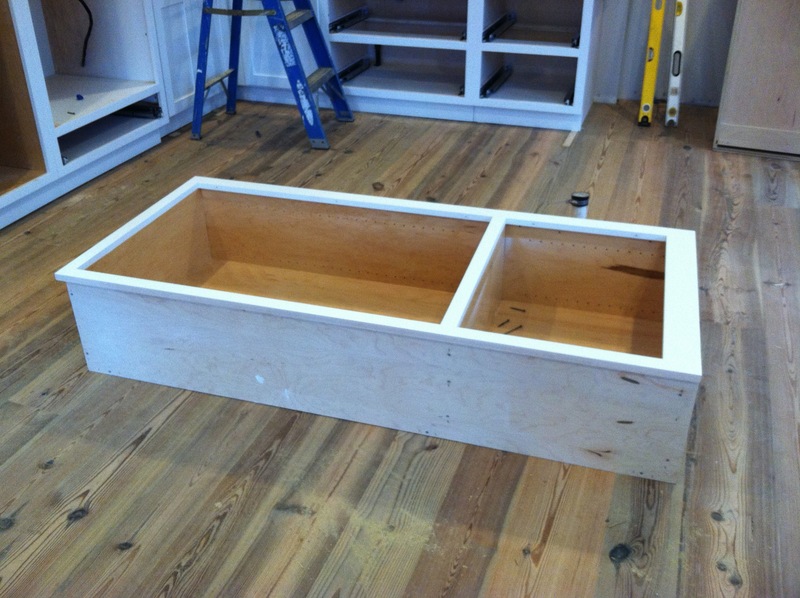 Our shoe cubby was made along with the kitchen cabinetry and John fashioned the top from leftover flooring. 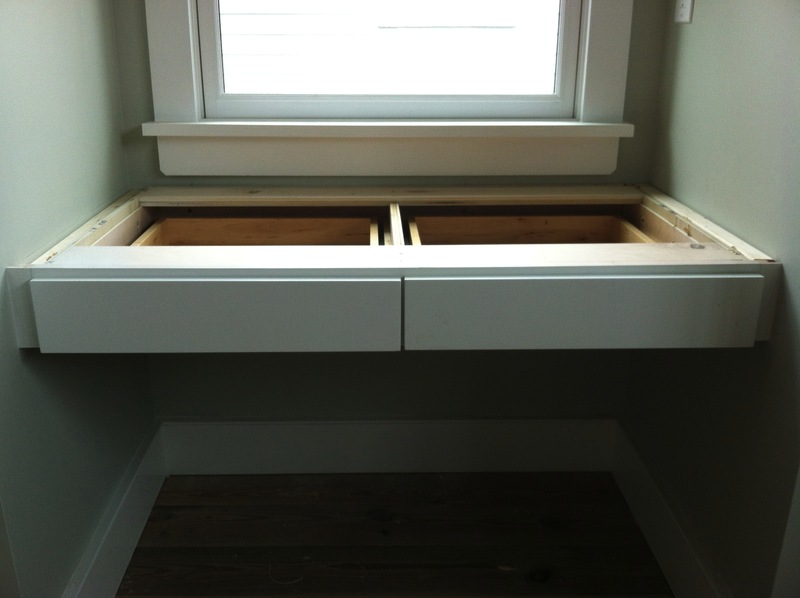 A built-in desk was also made for an upstairs bedroom. John will make a top for it as well. 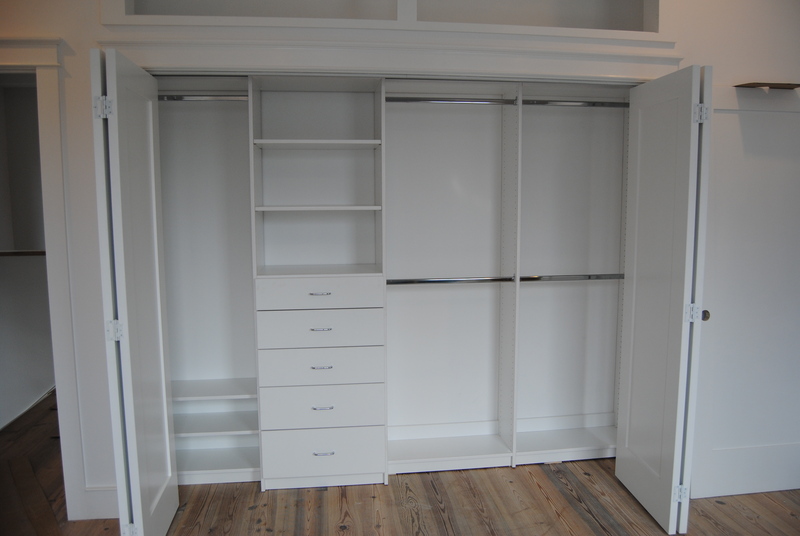 Also happening this week is the installation of closet systems by Closet Factory. 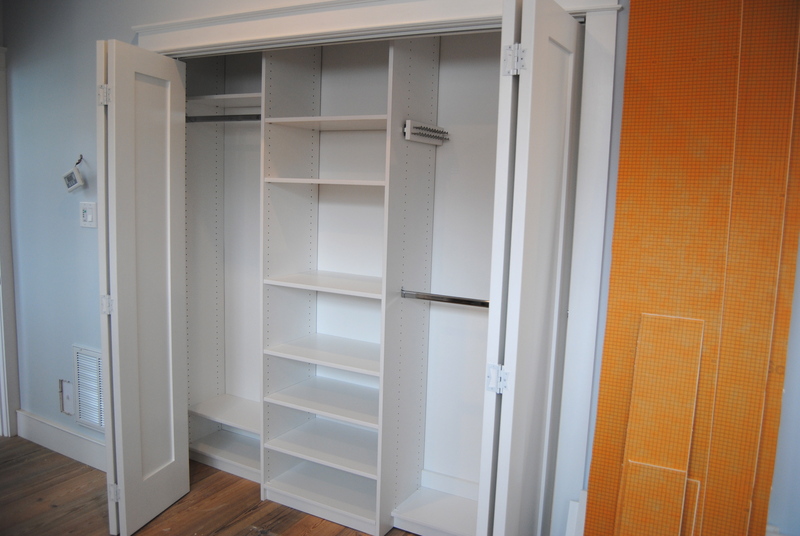 Mallory definitely scored the best and biggest closet! My former neighbor, Sue Pike, helped me plan the best use of space in the bedroom closets. I am thrilled to incorporate friends into our home. She has great ideas and a no-nonsense, professional style. 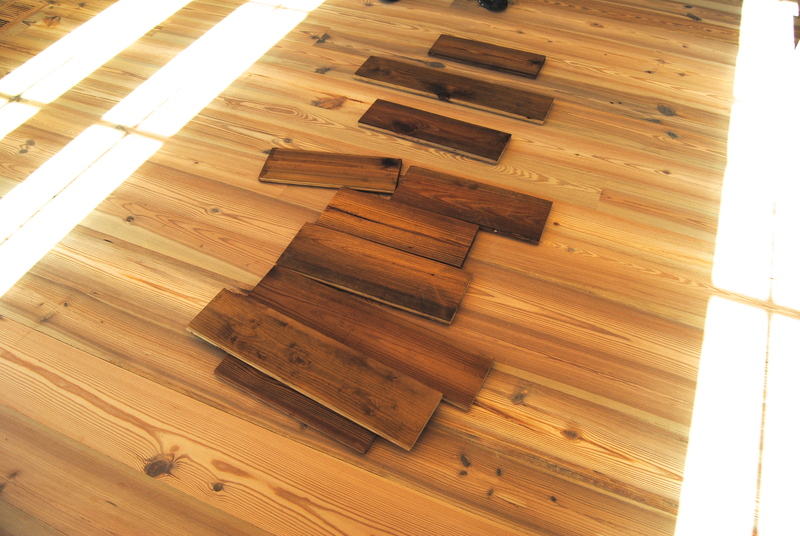 We were happy to find that the Closet Factory offers “green” materials made from recycled wood and free of formaldehyde. 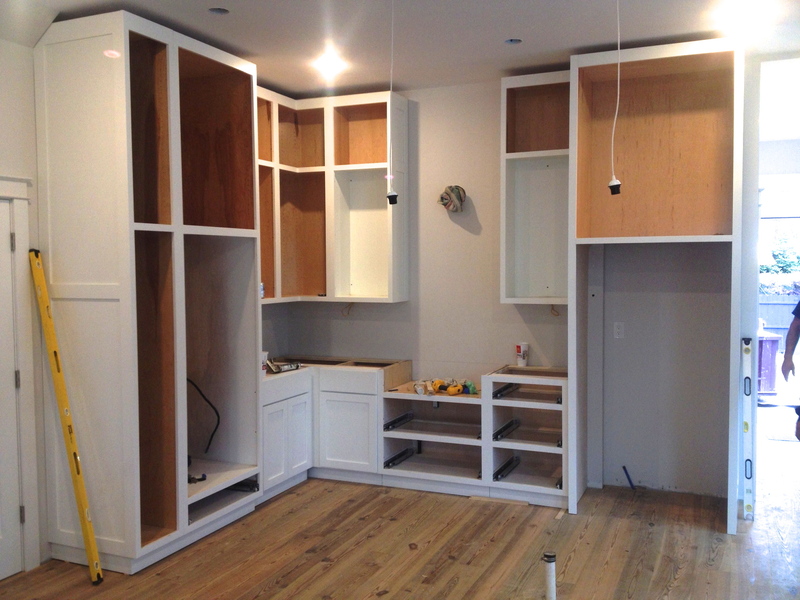 Here is a look at the master bedroom closet that shrunk during the ductwork installation. Mallory’s closet is about 50% larger than ours and two of us will share it. Limited space should be an effective reminder for us to shop and wear responsibly! John and Bobby are moving on to the bathrooms. 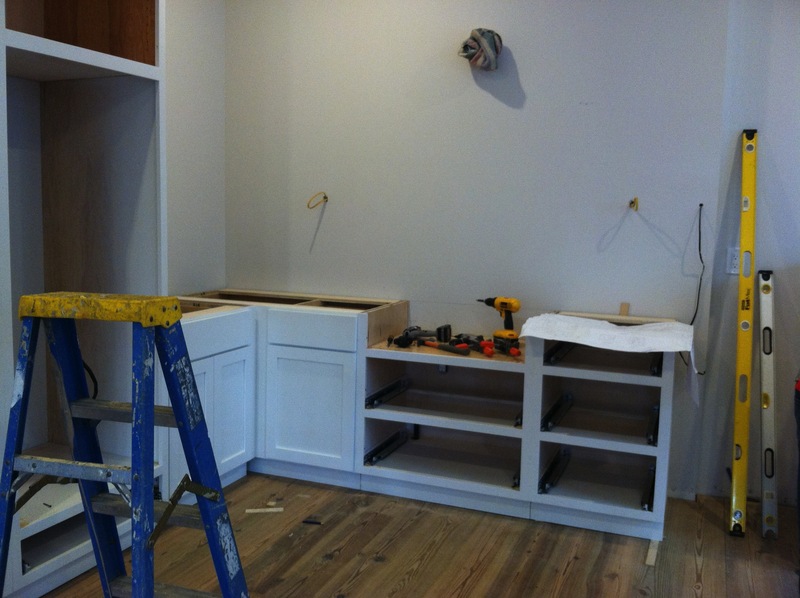 Laying tile and installing toilets and sinks!